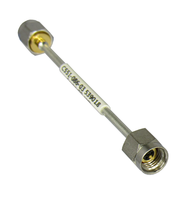 The 2.92mm Coaxial Cable assemblies here are rated to 40ghz. Currently we have hand formable 2.92 cable assemblies, flexible 2.92mm cable assemblies for interconnects, and a more rugged flexible 2.92mm test cable assembly. These 2.92mm cable assemblies are rated to either 1.3 or 1.35 max vswr 0-40Ghz. Please click on a subcategory on the top drop down menu above to see our detailed offerings of 2.92mm cable assemblies.